Ask about our discount pricing for purchases of 2 or more...the more you order the more you save! MAGNIFICENCE HAND TOWEL: This is the luxurious HAND TOWEL which is 16"x32" with hemmed ends and ribbon trim. These are the ONLY bath towels still made in the USA! 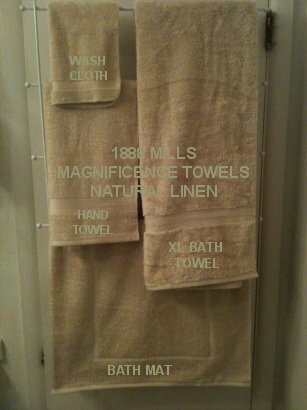 From 1888 Mills in Griffin, GA. All 1888 Mills towels are available separately and we have also put together two different complete sets, the Elite Towel Set and the Deluxe Towel Set. We also offer a Hand Towel 6-pack for larger quantities and greater savings.. Two colors available: Natural Linen and White. Natural Linen is a very light tan or beige--see pictures. 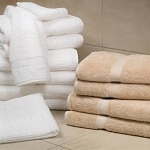 Quantity discounts available for 4 or more of a particular style.Note: These towels cannot be purchased directly from the manufacturer. Customers must go through authorized retailers, like Strictly USA. Ask about our discount pricing for purchases of 4 or more...the more you order the more you save! HAND TOWEL: This is the luxurious HAND TOWEL which is 16"x32"
Best quality towels ever. Highly recommend to others. Fantastic find!. Big fat thirsty towels made in good ole' USA. Alex, I just love these towels. So happy with all my purchases. Thanks for the help. Will continue to do my online shopping here! We love the towels. They are so very soft and not too heavy. We are also so happy to be purchasing towels that are made in the USA. I love them. Very soft. Durable. Beautiful.